With the rise of live video on Facebook (just look at 4Networking's growing use of it in the Saturday morning 4NTV Live and the new 4Development Live), how can companies and brands begin to incorporate them into their marketing strategy? We look at what tips and features are best to utilise to help add Live video into your business. Facebook has put much of its recent marketing efforts in promoting the power of Facebook Live as you may have seen on TV. 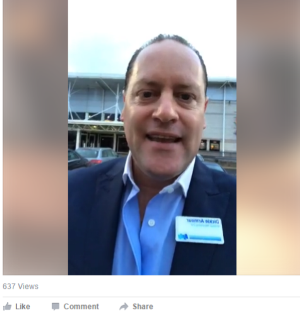 Facebook Live is a great tool to let your friends know what you are up to, where you are and is great for events, seminars and any interesting and inspirational advice you can share with your friends. Your audience can also comment while you are live meaning you can interact with them on the spot. Promote that you are going live with a compelling description to draw people to your broadcast. This can be a normal post or a promoted post. Encourage viewers to follow you. Interact with people you see watching. You can see who joins the stream and interact and give shout outs. When doing a 1-2-1 on Facebook always consider your background and lighting. Make sure it is tidy and presentable. Encourage interaction with your viewers. This is a great way to interact with your audience as you speak and make the experience personal. Once you finish the live broadcasting, the stream will be saved to your Facebook page so people who missed it can watch it. You can also save a copy to your camera roll. Short form video is a great way to showcase snippets of events, seminars and product launches. You are able to build a narrative by building up videos that your viewers can then click through. They have both shown great engagement statistics and a lot of top brands are beginning to use them very effectively. Although Snapchat videos are restricted to short broadcasts you are able to create strong narratives by building up the stories which is a great way to showcase a product launch or event. You can also use snapchat to showcase your products and facilities. Simply download snapchat and start recording at your events and product launches. You can also use Snapchat to build anticipation for a new product by giving people an inside VIP perspective. Similar to Snapchat, Instagram also has the capabilities of creating short videos that you can use to build up a narrative. 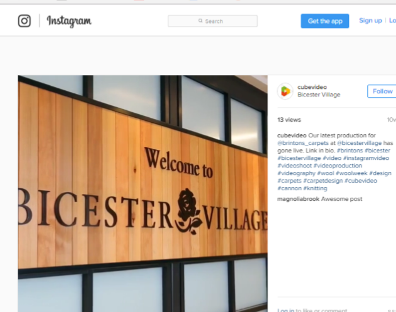 This is another great way to showcase a product launch or event and can be used alongside standard posts on your Instagram page. Instagram stories are an extension of your Instagram profile and people will be drawn to them when they are scrolling through their feed. These videos are listed at the top of the page with a small circular photo of the user who has posted a video. We would suggest you pick either Snapchat or Instagram depending on what audience you are targeting and where they prefer to interact. Instagram is the easier one to start with as it is an extension of your existing profile and easier to attract followers. To begin using Snapchat you will need to connect with existing contacts/connections and also promote that you are on Snapchat across social media. People will then be able to request to become friends with you or follow you using your username. Here is an example of an Instagram video, click on the image to view it + another link underneath. So get out there and start using live video in your business! 1 in 5 Business Owners "Highly Stressed"
Add an article to advise and inform the 4Networking community.